While surveying some age problems in Joseph Degrazia's Maths Is Fun, I came across the following 1949 word problem. Bill is twice as old as Sam was when Bill was as old as Sam is. When Sam is as old as Bill is now, both of them together will be 90. Since no solution was given in the book, I assume that the author then would most likely expect the problem solver to use an algebraic approach to solving it. I needed to read the question a few times, before I felt confident that I was in control of the problem situation. 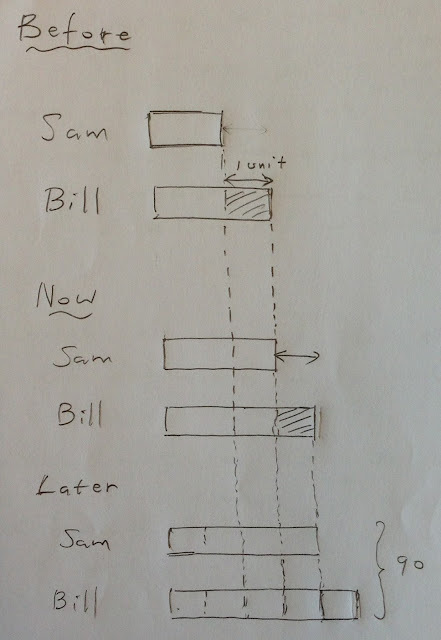 That made me believe that one major obstacle for students attempting to solve this vintage problem would be to really understand what the question is all about—how the ages of Bill and Sam are related at different times. 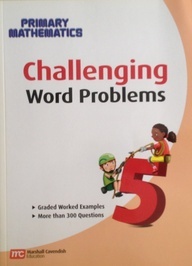 However, regardless of the method of solution used, this word problem might also prove to be quite a challenge to those who are learning English as a second or third language. Among competing non-algebraic approaches, especially if this question is assigned to grade 5 or 6 students, my methodological bias in favor of the Singapore model method convinces me that a visual approach would offer an elegant, if not better, solution to the problem, as compared to an algebraic method of solution; in fact, the word problem does lend itself quite well to the model, or bar, method. Try solving the question, using the model method, on your own first, before peeping at a suggested model-drawing solution below—you may even come up with a better model than mine. Here's a quick-and-dirty Singapore model solution to the above vintage age problem. Observe that the age difference between Bill and Sam is always one unit. Bill is 40 years old. Sam is 30 years old. When Bill was 30, Sam was 20. 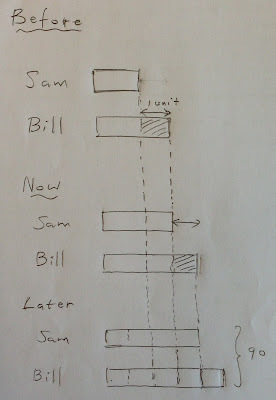 When Sam is 40, Bill will be 50 and both will be 90.
the Singapore model method confidently. Even for students who like math, the trouble with this age problem isn't just about exhibiting clear thinking and reasoning, but also about language proficiency. Language and logic, particularly in this case, each play an important part in the thinking process in producing the correct product. Moreover, a model-drawing solution to this vintage problem also shows that this question, which would normally be solved algebraically at a higher level, could be posed to students at a lower grade. Degrazia, J. (1949). Maths is fun. London: George Allen and Unwin Ltd.